This a brief summary of the information presented at yesterday’s meeting in Stockton about the cherry vinegar fly, now known as the spotted wing drosophila (SWD), Drosophila suzukii. The purpose of the meeting was to update researchers, growers and industry personnel on the status of this pest. 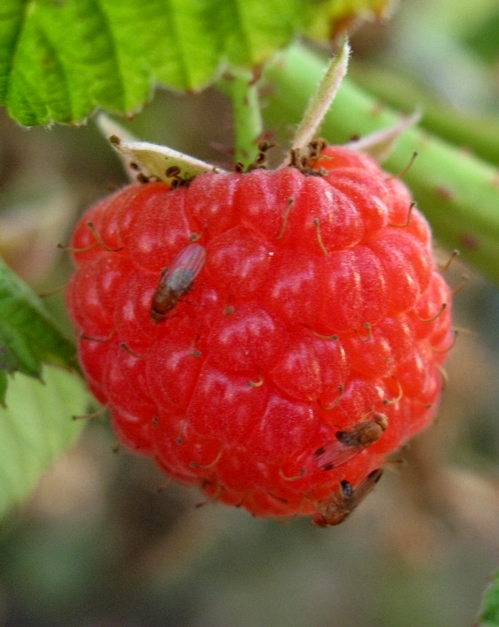 Spotted wing drosophila has now been found in cherries, raspberries, blackberries, blueberries, and strawberries in California. It has been found in many (I think the number was 21) counties across California, as well as several other states. However, in the case of detections from other states, it has not yet been determined whether the detections come from fruit grown in those states or simply were fruit from infested areas of California incidentally brought back into California. Of the 3000 species of Drosophila commonly known as vinegar flies only two have been found to be harmful to crops, of which the spotted wing drosophila is one. The female has a serrated ovipositor, meaning she can penetrate the skin of most thin skinned fruit. In the lab it takes from 2-3 minutes to oviposit, and this oviposition is not necessarily successful each time. Nevertheless, in an experiment done by Artyom Kopp from UC Davis, three females put in a test tube with a Thompson seedless grape had several dozen eggs laid overnight. A female will lay 2-3 eggs per fruit, and will lay around 350 eggs in her lifetime. The life cycle in the laboratory, from egg to egg laying female, is 12 to 15 days at 65o F. The egg and larvae develop inside of the fruit, and while experts at the meeting said that pupation takes place inside of the fruit also, I have taken many samples of strawberry and raspberry and they are always exiting to pupate. It is thought that SWD will have ten generations per year, and probably 3 generations in one crop of cherries. Thus, the population growth potential of this pest is tremendous. They are most active at 68o F and activity becomes reduced at temperatures above 86o F. Above 86o F, males become sterile. Eggs, larvae and adults (probably pupae are not far behind) die at temperatures below freezing, but this does not necessarily mean a whole population will be eradicated at lower temperatures, since D. suzukii is firmly established on the island of Hokkaido in Japan, where winters are quite cold. Additionally, vinegar flies in general are very sensitive to dessication, and will die within 24 hours in the absence of water. On the regulatory side, we were informed that neither the CDFA nor the USDA are recommending any regulatory action (such as a quarantine) at this time. On a conference call regarding SWD with USDA and the National Plant Board, no other states made any commitment to conduct a survey for this fly. While the state of Oregon may have some concerns with this pest, they have to prove an absence of it before any action can be taken. Spotted wing drosophila adults on raspberry. How does the Spotted wing drosophila over winter? It seems to me, and this is on short experience, that the spotted wing drosophila overwinters on the Central Coast as a viable adult. In the winter of 2008-2009, we continued to trap them into January, and I continued to trap them again in late February early March. I live in the Rogue Valley, in Oregon (Jackson County). I was recently capturing wild fruit flies for School, and am now attempting to Identify them. Some of the fruit flies I have captured look suspiciously like those pictured here. In comparison to the D. Melanogaster, they are larger, with much larger wings in proportion to their bodies, and of cours sport spots as pictured here. The flies were captured off of my compost pile, near several fruit trees. Is there any way I can better identify these flies as D. suzukii or not? If they are D. suzukii who should I alert(or is this not of great concern?) I was unable to find other reports of this species nearby in Oregon. Thanks! Take it to your local extension office for confirmation. Vinegar fly identification at the species level is not easy, you should know that there are several species showing spots like D. suzukii. That said, the odds are really high that what you are seeing is D. suzukii, since the other ones are not common or don't even exist in the US. While of course D. suzukii is a pest of concern, it is not a regulated pest, so what you need to worry about is managing it on your fruit trees. Thanks! I gave a few specimens to a local entomologist at Southern Oregon Research & Extension Center. He confirmed that the flies were indeed SWD. Set some traps out. I am a retired plant pathologist and researched virus, virus like diseases of stone fruit. I am curious to learn what methods are being used by the fruit growers in Japan to combat this insect. That is something actually that we are looking into now. With some really great assistance, I have been able to review some papers from the Japanese scientific literature as well as communicate with professionals from that country. The conclusion is that control is very achievable and comes down to pesticide sprays (most mention is of pyrethroids and OP's, although there are others). Control initially was using traps (and this continues in China), but that has been abandoned for the most part. Organic production, much like our own, is difficult in the presence of SWD however. I'm compiling SWD references in a file for research at Michigan State University. I couldn't help but notice that you've tagged this particular post as "spotted wing drosphilid" instead of "spotted wing drosophila." This is the only post that is tagged unlike the rest and I would like to politely point out that all of your SWD postings will appear under the same tag link if you tag them similarly. I am glad that you've taken this step into cyberspace. Scientists are usually slow to occupy this role; even extension specialists! I went ahead and killd the "drosophild" tag, I put it up when I was still new at SWD. Drosophilid is not really a correct way to refer to this pest, so it's good to have it taken down. Thanks for the encouragement on the blog, it has served very well in getting information out on a pest that has suddenly taken on nationwide significance. My neighbor and I here in Vacaville lost our cherry crops to SWD last year and are trying to decide on a course of action for our 4 trees this year. Her nurseryman sold her a natural pyrethrin chemical and suggested she spray the ground with it before May 1 to prevent the flies from emerging from pupae on the ground, and then spray the trees weekly through May. From what I've read it seems the ground spray is not likely to be important, and that we should use GF-120 NR Naturalyte instead. Your thoughts? The natural pyrethrin chemical you refer to is inevitably Pyganic, with which I was able to obtain one day of efficacy in two trials last year. I am looking forward this coming year to see what the effect will be of using this material repeatedly in the field as you are suggesting. I suspect there will be some effect, but of what magnitude I can only guess at right now. Our stance on the GF 120 Naturalyte is that at low levels of SWD infestation it will work, but it is insufficient to suppress heavier infestations. This is to say you might want to be using it now when the infestation is just getting going, but as things pick later (especially as you start to see color on the fruit on the tree), you may want to switch over to your pyrethrin sprays. I'm writing from British Columbia, Canada. I'm agronomist and now I'm working in blueberry's farm. We have serious problems this season because we found a huge quantity of Drosophila Suzukii larvae in blueberries maturing fruits. This pest has taken us by surprise because We never expect this quantity of infested fruit. Now We need an action plan and your help. How can I get a action plan for Drosophila Suzukii? Do you have a sheet for fruit fly monitoring? What temperature kill Drosophila Suzukii larvae and pupae? All information that you have about this pest I'll be gratefull. For temperatures which kill D. suzukii, read the post on cooling. This has been confirmed now in several quarters. Your problem in blueberries however, is that fly infestation leaves blemishes on the fruit so once infested fruit is indeed unmarketable. I think your course of action now is to apply pesticides, since you have discovered that your field is infested. Any of the materials listed in this blog work, and if the situation is organic, read the posts from early last month. There are options and they do work. Additionally, what we have been recommending in CA is to clear old and rotten fruit from the field, but I don't know if this option is workable in fields which are mechanically harvested as are so many in the Pacific Northwest. Let me know it goes. Has the Spotted Wing Drosophila been found as far north as the Sunshine Coast of BC, Canada? Our raspberry crop this year is infested with tiny white worms inside the fruit. I have already cut down my fruiting canes, so don't think I will be able to trap an adult fly. I have a wonderful large cherry tree in Santa Rosa California that became infected with this fly during the spring of 2010. Unfortunately, this continued in 2011. I was told by a farmer in Winters Ca to hang plastic water bottles of banana and cider vinegar and my neighbor hung yogurt containers of red wine and honey (I had found this remedy on-line). They seemed similar and the idea was to attract the fly into the containers instead of the fruit. Unfortunately, neither one worked. The first year I spent 9 hours picking fruit and throwing it away in hopes of getting rid of the culprits but this did not make a difference the following year. I have had 4-5 white worms/grubs in most of my beautiful cherries the last 2 years and don't see any solutions so far. The birds enjoy their 2 for 1 sweet protein food but it's sad for us humans. Sorry to hear about your travails with SWD on your cherry. Cherries seem to be the favorite host of this pest. 1- I do not have experience with traps of red wine and honey, but would recommend going forward that you use the standard yeast + sugar + water trap suggested elsewhere in this blog. 2- Fruit removal for someone like yourself might not be the answer, since other host plants are inevitably very nearby, either in your own yard or your neighbor's. 3- If you are amenable to trying, you could spray the tree when most of the cherry fruit enters the straw colored stage. Oils and soaps do not work, spinosyns and pyrethroids do work quite well. Remember these are pesticides so be sure to follow the label closely. To kill the emerging flies would it be effective to spray the ground around our home orchard cherry trees with malathion, at the time when the fruit begins to ripen? I think you will be more successful if you spray the ripening fruit, and my understanding is that you would want to this when the fruit is around the color of straw. Malathion will protect your fruit for about two weeks, so you may need to do another application after that. Spraying the ground will not be that useful, since it is almost certain the flies attacking your fruit are coming as adults from somewhere else.